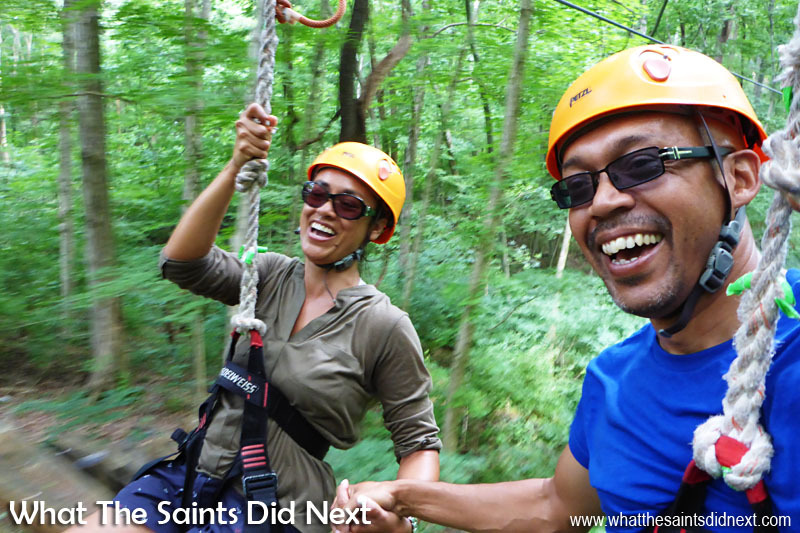 They say, ‘do one thing every day that scares you,’ and Darrin’s chosen to go zip lining with Music City Ziplines of Nashville on his birthday but I don’t think my nerves could take it; would once a year suffice? My palms sweat just at the thought. It’s a decision that’s not taken lightly, given his fear of heights and the fondness I have of my feet being firmly planted on the ground. What a bunch of wimps! We’re in Nashville, Tennessee, which is also part of the birthday treat as Darrin’s a huge country music fan. 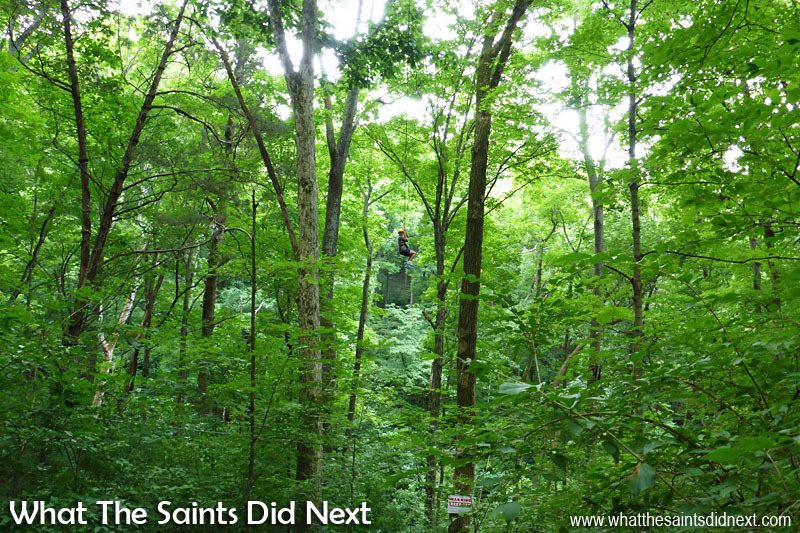 The zip line is less than an hour outside of downtown, on the Fontanel ranch, formerly owned by country singer, Barbara Mandrell. 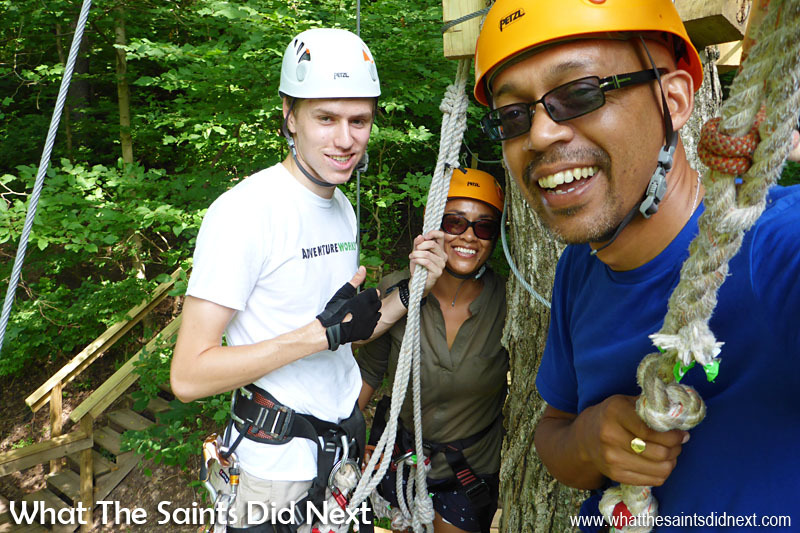 The Fontanel Ranch is the meeting place for our zip lining experience. 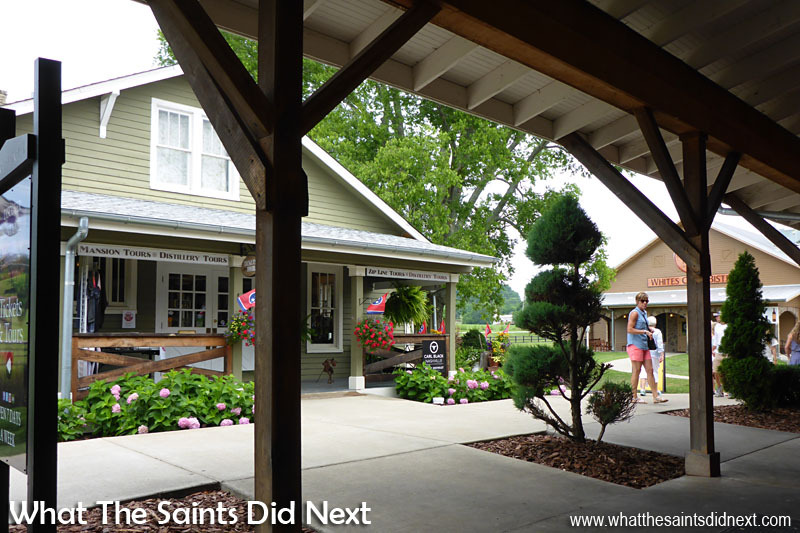 There’s a restaurant where we had a coffee while we waited, a gift shop where the Barbara Mandrell connection is apparent and out back is a small outdoor concert venue that hosts some big names, including the one an only Bryan Adams who was playing there the next night. Moment of truth – and faith! 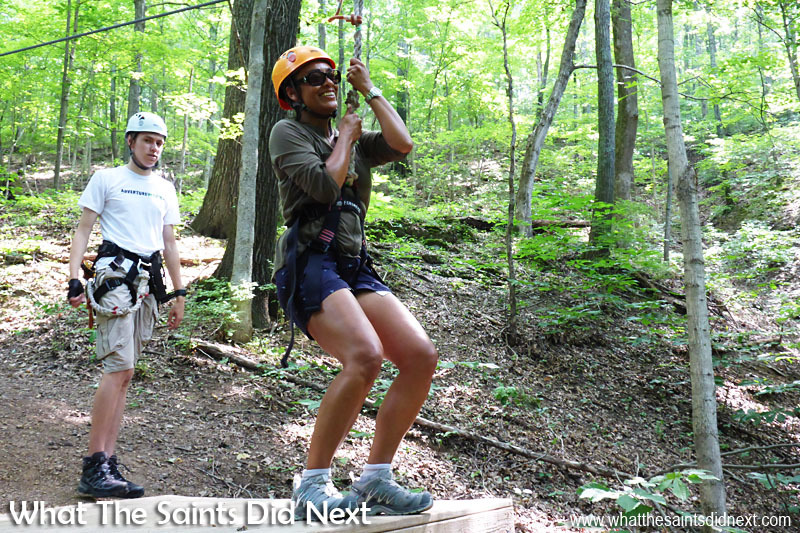 Time to trust the zip line, sit down and let the ride begin! Zip lining with Music City Ziplines of Nashville. No one else is booked for the 9.30am slot so we have the undivided attention of Kimbro and Corelee, our guides for today. They run through the safety brief, get us harnessed and drive us into the forest where nine lines are waiting to be zipped. For those who enjoy nature and outdoor activities here’s a list of adventurous places to visit in the US for couples. Now, I realise zip lining seems tame to a lot of people and adrenaline sports like bungee jumping and parachuting is fast becoming the norm, so it’s not such a big deal for some. But it is for me. I hadn’t realised how much until it’s my turn to take flight. 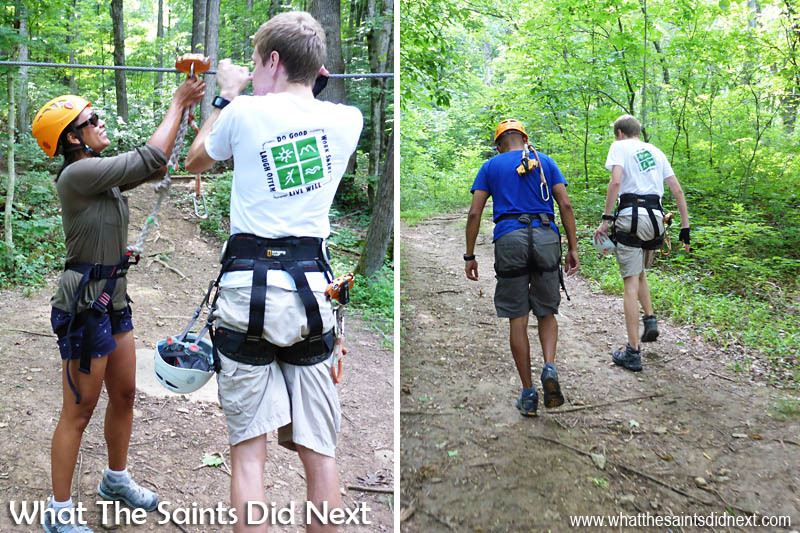 “You’re officially zip lining when your feet leaves the platform,” coaxes Kimbro. I reason to myself, what’s the worst that can happen? Well actually, being stuck mid-way, slamming into a tree or the line snapping! 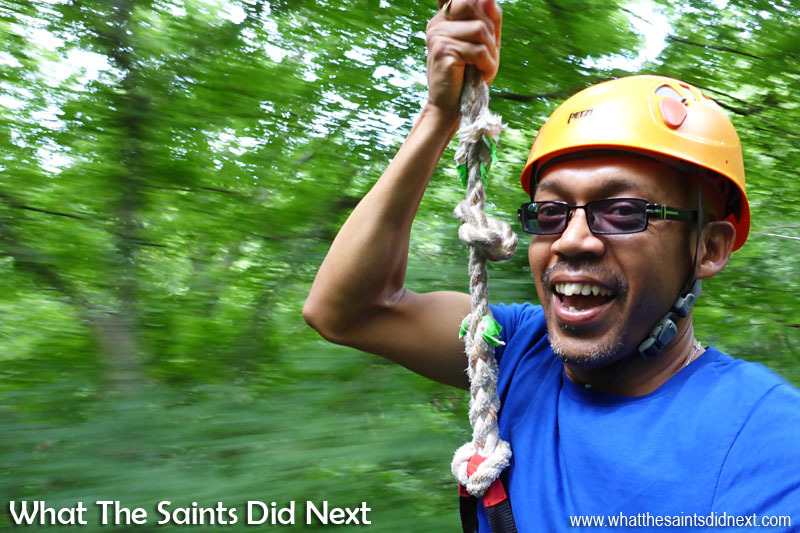 Zip lining with Music City Ziplines of Nashville: This shot of me holding on for dear life, gives a great idea of the height of the zip lines through the forest. Each zip line took us across a gully or little valley, so at times the mid-point height above the ground was rather impressive! 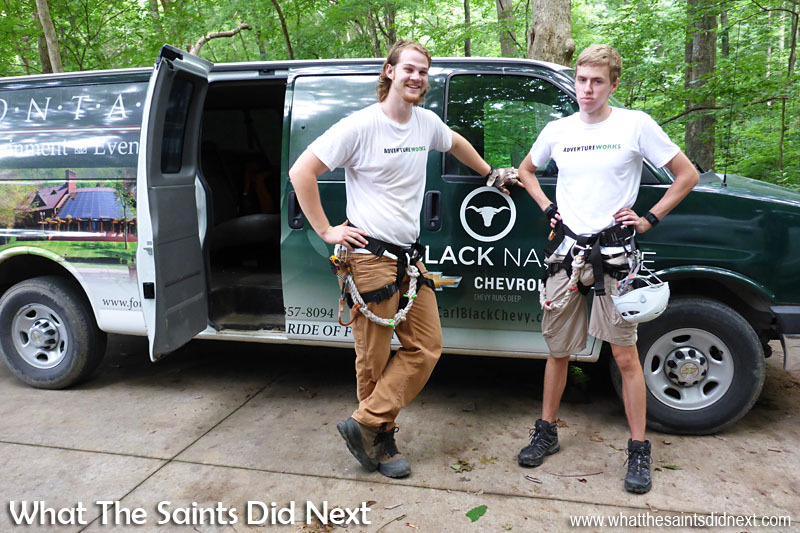 Zip lining with Music City Ziplines of Nashville: The harnesses were quite a snug fit! Taking a deep breath I step into mid-air… and fly. All too quickly I’m on the other side, face flushed that I did it. Although, that was just a baby one intended to be a warm up. The trees were a little too close for my liking but the landing wasn’t so bad. A slack on the line acts as a brake which slows momentum towards the end. The harness fits around the waist and hips and is designed to act as a seat. An attached pulley wheel is locked over the zip line. We’re told never to place our hands on the line, however, if we’re comfortable enough we can go hands free! I try but can’t seem to get my hands peeled off the harness. Darrin somehow took eight selfies during his ‘zips’ which were all a blurry mish-mash, but this one came out quite well, capturing the the rush effect through the tree tops. Zip lining with Music City Ziplines of Nashville. At times, just getting onto the ‘take off’ platforms was as much of an adventure as the zip lining itself! Zip lining with Music City Ziplines of Nashville. 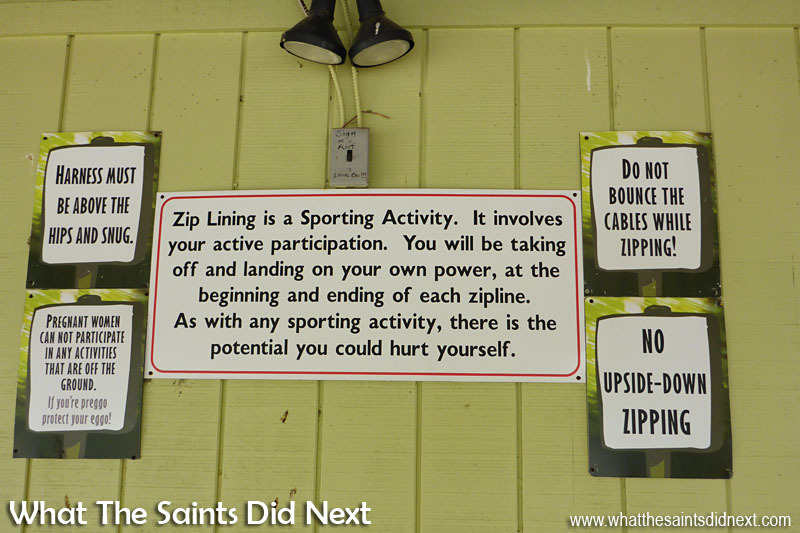 The other zip lines are longer and higher. I love the feeling of flying and being high like a bird whizzing from tree to tree. It’s such a rush. But I still have to force myself to relax and absorb the beautiful forest view. Whilst walking in the woods between zip lines, we spot the speckled body of a young deer watching us through the trees. What a bonus. I’m determined to get good photos of the day but operating a camera is proving too much of a distraction from keeping myself alive. It’s a multi-task I just can’t comprehend. Squeezing onto the take off platform with Corelee, all roped up and ready to go again. Zip lining with Music City Ziplines of Nashville: The final run of the day had two zip lines running side by side which meant we could fly through the tree tops together. Brilliant fun. The birthday boy, whose fear of heights seems to have vanished, is zipping ‘no hands’ and assumes the photographer role. His smile says it all; Darrin’s having a blast and totally conquering this challenge. Do one thing every day that scares you? This is too enjoyable to still be scared. 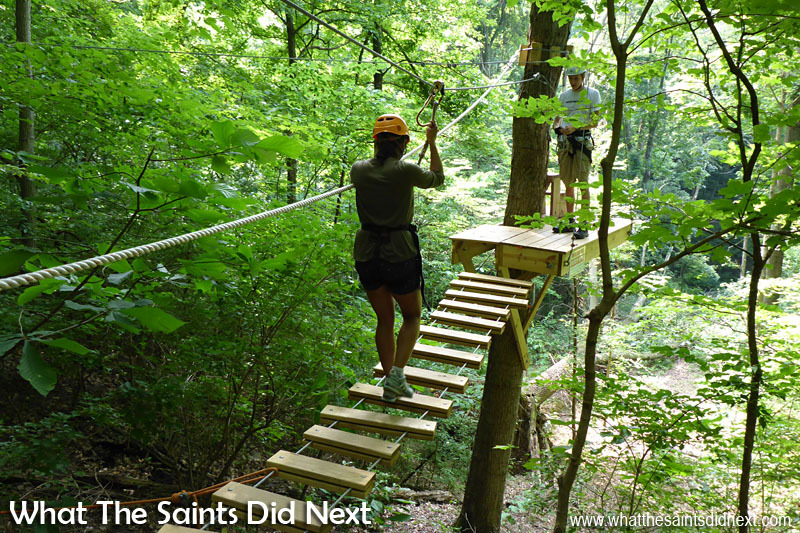 Zip lining with Adventure Works at Music City Ziplines of Nashville is less than 7 miles from Downtown Nashville, just off Highway 431. Although, considering traffic allow at least 30 mins to get there and probably an hour minimum at peak times. Click the map image or Click Here to visit their website for more details. 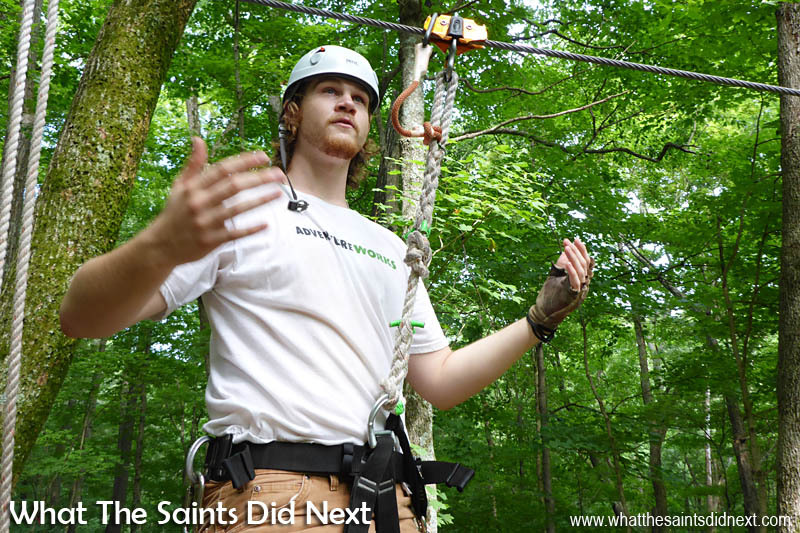 We zipped 230 metres of lines, 30 metres high off the Fontanel forest floor with Music City Ziplines by Adventure Works. A little hiking to each line is required but it’s not strenuous. However, a moderate level of fitness is advised as there are inclines and boulders to climb. We paid $59 each, kids (17 and under) cost $48. It was fantastic fun, completely safe and gorgeously beautiful. We’d do it again. Zip lining with Music City Ziplines of Nashville: The instructors who played tour guides through the forest as well as keeping us safe on the high wires, Kimbro (left) and Corelee. They even tuned in a country music station on the bus radio for Darrin, even though it turned out neither were fans themselves!